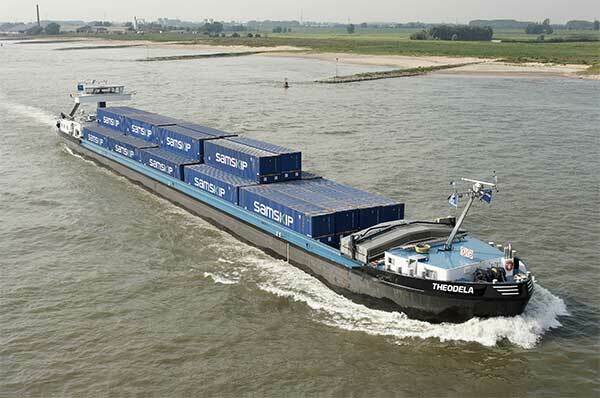 Multimodal network operator Samskip and inland waterway transport provider Pro-Log are celebrating the 10th anniversary of barge operations connecting Rotterdam and Duisburg by adding a second vessel, increasing service frequency to six times weekly. May 1, 2016 completes the first decade in the cooperation between the two unitised transport specialists, one a pan-European operator of ships, trains, trucks and multimodal equipment, and the other a dedicated river barge operator. “Reliability is a cornerstone in the competitive case for multimodal transport, and nowhere is it more crucial than in the corridor between Rotterdam and Duisburg,” says Leo Osseweijer, Samskip General Manager Procurement & Equipment Control. “Over the last decade, Pro-Log has proved itself reliable day-in, day-out, as well as cost efficient and flexible enough to work with Samskip as a true partner always ready to consider the bigger picture. Mr Osseweijer said that the service levels achieved by the Pro-Log vessel Theodela (60x 45ft container capacity) had proved decisive in selecting an inland barge partner a decade ago, and that the three times weekly service had since proved “second to none”. Adding a second vessel increased the service offering to six times a week in both directions, while also making it possible to expand the offering by adding calls in Nijmegen within the schedule. The partners marked the occasion of their 10-year cooperation in an informal event held at Samskip’s corporate headquarters in Rotterdam, marking the service launch date of May 1, 2006.